This has been a week of small starts and no finishes. Work on the blanket continues. I swatched for socks and a tee, but have to wash the swatches before I can do more. Here is the red blouse I have been working on – languishing in want of a zipper. What do you think? I’m pretty happy with how she is shaping up. I recently bought the Wiksten Tank pattern and this fabric to make it in. Yummy! My Sister in Law recently had a birthday. She loves books even more than I do (and I love books a lot), so I made her this necklace. I hope she loves it. I’ve been saving this book charm for a long time. A very basic but fitted dress out of grey…stuff (the fabric was given to me, so I’ve no idea what the fiber content is). I had just enough to make the dress – I even had to piece it in a few places. This dress is great on its own or as a layering piece, meaning I can wear it year-round. Perfect! This next project is something I started in high school, but had not yet finished. A sleeveless vest with tatted lace in the back. All I needed to do was finish the arm holes. My friend has a horse, so here are some gratuitous horse pictures (also showing my recently finished Perry cardigan). I am a lizard. Not literally, obviously, but I grew up in a very warm climate. So when it gets cold out I get very very cold. Last winter I decided I wanted the warmest, fuzziest bathrobe ever, so I started shopping around. They were all so expensive! So, frugal woman that I am, I decided to make one. How hard could it be? Knitting would take too long, so I decided to sew it. Out I went to my nearest fabric store and bought the fuzziest pretty fabric I could find. I didn’t have a pattern. But I am a smart, independent woman who doesn’t need no pattern! I measured myself. And then did some math. Measured again. Measured fabric. Did more math. Confused myself. Then repeated the whole process until I was satisfied that I was probably right. Now came the big step: cutting! This went really well…until my cats decided that my scissors needed to be attacked! (Please, don’t worry about the kitties. They were not harmed. They were just annoying.) With my pieces cut out, I threaded my sewing machine and did most of the sewing. At which point I stopped and shoved it all in a bag to be completed later. Maybe it got warm then? The other morning I was cold – which makes sense, since it’s fall. I remembered my partially finished bathrobe and decided the time had come to finish it. I pulled it out of the sewing box, cut out some additional pieces, and set out to finish the beast by hand (my sewing machine makes a great paper weight, but isn’t good at much else right now). So let me tell you, Chenille fabric is a lot nicer to work with than chenille yarn. The edges don’t curl or fray, so you have the option to not finish them. It makes for a pretty straightforward sewing project. Which was great, until I got to the cream fur fabric I bought for the trim. Remind me to never sew with furry fabric again. Especially by hand. In the end I came up with a pretty great bathrobe. It’s very fitted, almost like a dressing gown, which I absolutely love (In fact, I’m going to call it a dressing gown. It sounds so much more classy). But the armholes are a little tight. And it doesn’t close with quite as much overlap as I had envisioned. I still have a little more finishing work to do, but all in all I am happy with my project, and I look forward to many years of warmth and comfort. 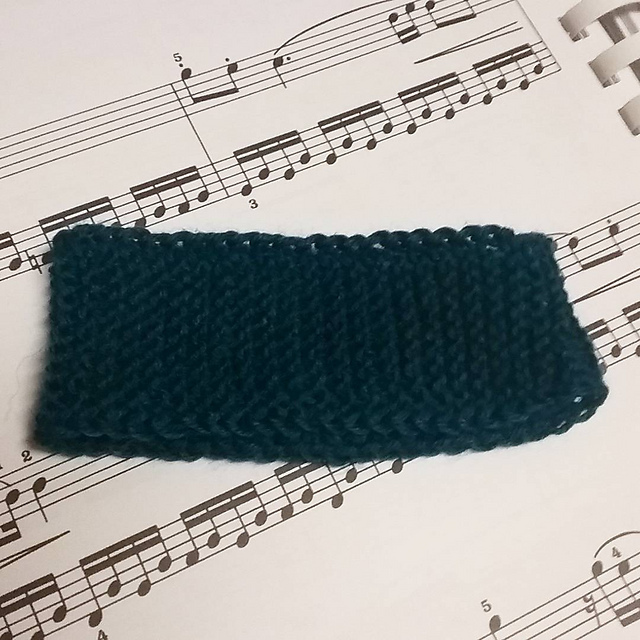 A wedding garter in garter stitch. I love the irony. I love the simplicity. I wonder if garter stitch got its name from garters? Also, my “something blue” (it is a little brighter in real life). 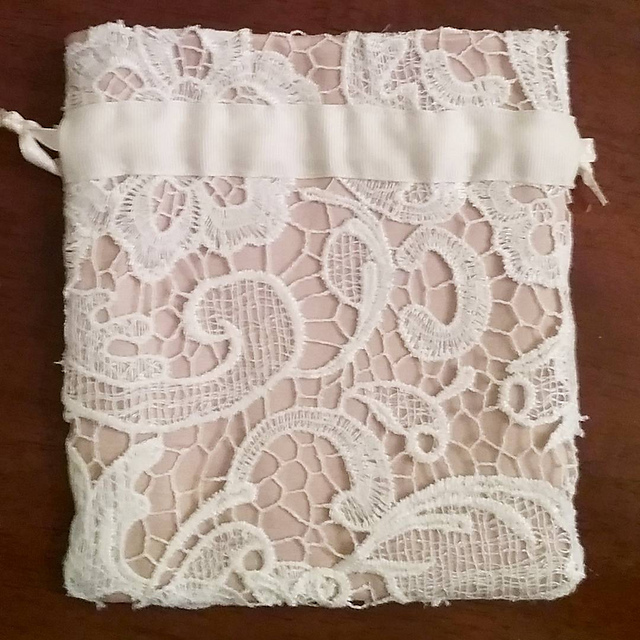 And a wee wedding wristlet, just big enough to hold my phone and listick. I am very proud of this: I made it 2 layers thick so there are no edges showing on the inside, and my topstitiching is all on the outer layer (well, except for a few rogue stitches). So my inner layer is remarkably clean and makes my little crafty heart beat with joy and pride.